About 1,600 Palestinians in Israeli jails have begun a hunger strike to protest at conditions they say are humiliating and unnecessary. But Israel's security minister said they would not bow to pressure and the prisoners could "starve to death". The inmates' demands include an end to strip searches and more prison visits. Israel argues that prisoners continue to plan attacks from within jail and their contact with the outside world must be restricted as far as possible. The open-ended hunger strike is currently taking place in several jails, and organisers of the protest say most of the around 7,500 Palestinians held by Israel are expected to join it by the end of the week. A statement from the Palestinian Prisoners Society announced the start of the hunger strike, accusing Israel of "robbing us of all our rights, treading on our dignity and treating us like animals". A spokesman for the Israeli prison service, Ian Domnitz, told AFP news agency that the protest would not be classified as a hunger strike for 48 hours but was already being deemed contrary to regulations. In response, prison officials have confiscated televisions and radios, stopped the sales of cigarettes and sweets, and stopped all visits. The Israeli authorities say the restrictions are needed to prevent prisoners from organising further attacks from their prison cells, and the protest will not lead to a change in prison conditions. "As far as I'm concerned, they can strike for a day, a month, until death. We will ward off this strike and it will be as if it never happened," Internal Security Minister Tzahi Hanegbi told reporters. The BBC's Richard Miron in Jerusalem says the stand-off could escalate in scale and political significance. Issa Qarage, a prisoners' rights activist in the West Bank, told Reuters news agency that the hunger strike would spread from the main prisons to detention camps in military bases. 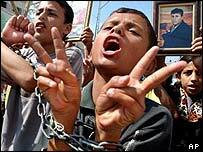 Protests have also been taking place in support of the prisoners, including in Bethlehem and the Gaza town of Beit Hanoun. Meanwhile, in the latest violence, a Palestinian stabbed an Israeli border policeman near Jerusalem, who then shot and killed him, Israeli police said. Israel Radio reported that the attacker appeared to be mentally ill.